I'm really enjoying the "About Me" journal, inspired by the talented art journalists on the the blissfully_art_journaling yahoo e-group. It has taken me to some very interesting places. Most recently I've been thinking about my childhood, my parents, and what it all means in the context of who I am today. In this 2-page spread, I wrote a letter to my 8-year-old self. 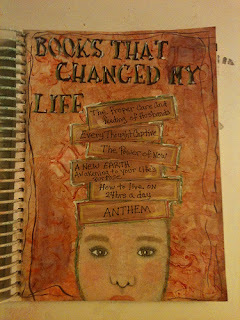 I also just completed a spread about the books that have changed my life. I'd highly recommend them to anyone. I love books that make you think and challenge you to be a better version of you (in whatever way is right for you).